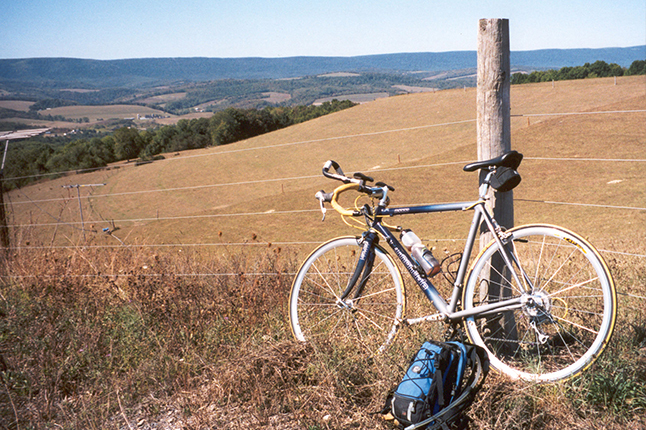 See Bedford County on two wheels! Use this link if you want to print all 5 bike loops listed on this page in one document. Area: All Over Bedford Co. This ride is a moderately difficult 16.6 mile loop with a few hard climbs. You will see 4 of Bedford County's 14 covered bridges along the way as well as some beautiful scenery. To start the ride, take Rt. 220 North out of Bedford to Rt. 56 towards Johnstown. Take Rt. 56 west for about 4 miles to Fishertown County Store (on your left). This is your start and end point. Note:For a 9 bridge loop to take in your car, visit the Covered Bridge page here. Starting at the corner of Richard and Pitt St. in downtown Bedford, this countryside ride takes you north on an 18.5 mile loop through the historic Dutch Corner area of Bedford County. It is mostly rolling hills with the exception of one pretty good climb about midway through. The trafic is light except for a small portion of Business Rt. 220 near town. There are no facilities along the route, so bring what you need. Starting at the Bedford Springs, this bike loop is approximately 42 miles long with the highlight being Lake Koon and Lake Gordon. These two water reservoirs, about 20 miles south, were created to supply water to Cumberland, Maryland. Area: South Central Bedford Co.
*This ride may also be started in Downtown Bedford by taking the Heritage Trail South on Richard Street to the Bedford Springs. Bedford County is home to many orchards that produce a variety of fruits. This bike loop takes you from downtown Bedford on a 26 mile ride where you will see the Bedford County countryside with the highlight being acres of orchards. For the ambitious rider, you can easily be connected to the Covered Bridge bike loop for an even longer ride. The Rainsburg / Colerain Township bike loop takes you through18.5 miles of scenic Friends Cove. The cove and the township are bordered on the east by Tussey Mountain and on the west by Evitts Mountain. Along the way, you will travel through the historic town of Rainsburg which has existed prior to Bedford County's incorporation. For folks who want to ride a little extra, you can connect to the Koon Lake Bike Loop by taking Rainsburg Mountain Rd. for 2.4 miles. Area: East Central Bedford Co.
For off-road riding, the new Huntingdon and Broad Top Rail Trail, which reuses a former railroad right-of-way to provide public recreational access along the Raystown Branch of the Juniata River, is now open. The H&BT Rail Trail is open to hikers and bikers with 10 miles of trail open between Riddlesburg and Tatesville. For a safe and easy route between the town of Bedford and the Bedford Springs Hotel, we recommend the Bedford Heritage Trail. To access this trail, head south on Richard Street in Bedford to the end of the sidewalk. The newly completed Heritage Trail picks up there and continues about 2 miles south to the Bedford Springs Hotel.